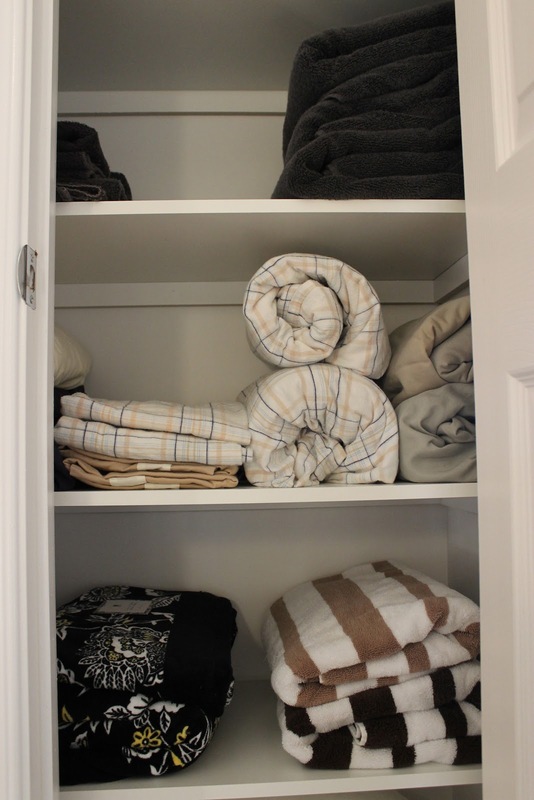 KM Decor: Organize It: Linen Closet! 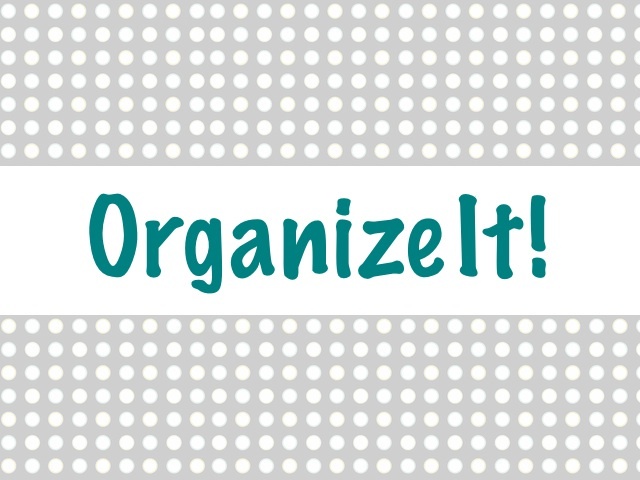 Welcome to the final post for "Organize It" week. So far, I've organized the kitchen fridge, laundry room, bathroom cabinets, and front entrance closet. 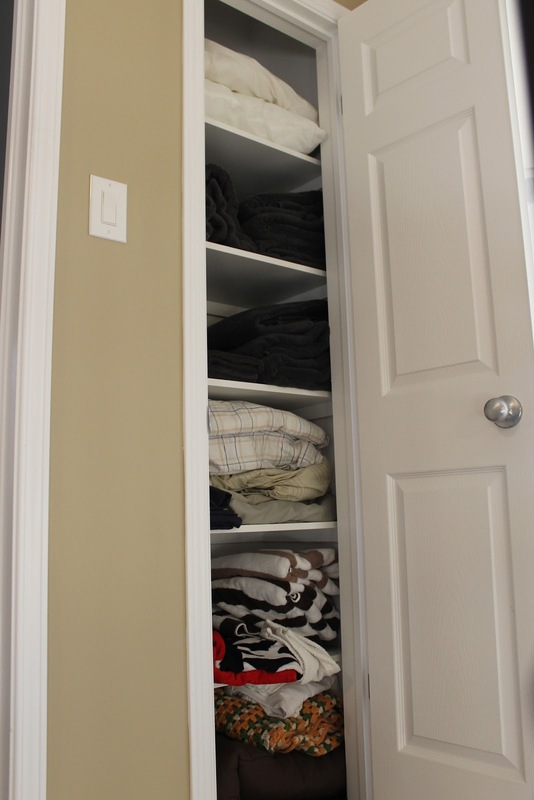 Today, I'll be looking at my linen closet. Unfortunately, I have been "blessed" with a very small linen closet. So, trying to fit all the sheets, towels, blankets, and extra pillows into this narrow space has truely become a challenge. 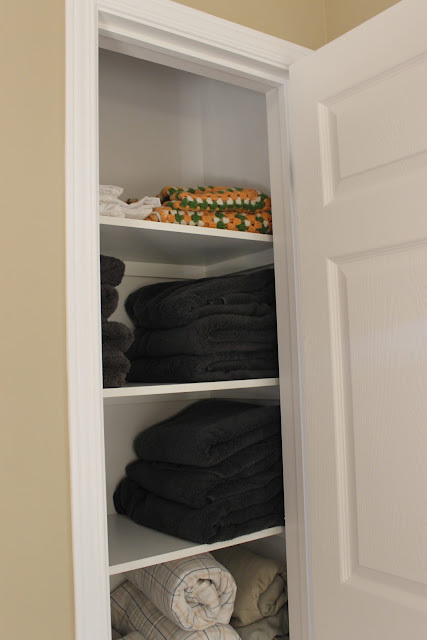 It's a good thing that we have open shelving in our ensuite to alleviate some of the extra towels (you can read more on how I organized those shelves here). I don't know about you, but I hate (and cannot) fold sheets for the life of me. Well, the flat sheet is easy peesy, but the fitted sheet?! I have no idea where to even start with that. (Sorry Mom - if you're reading this, I guess I didn't pay too much attention all those years when you were trying to teach me how to fold fitted sheets military-style). So, to fix the issue, I thought about rolling the sheets. What do you think? I'm trying it out for now and see how it goes, but at least these rolled sheets look better than a cascading pile of "folded" sheets. 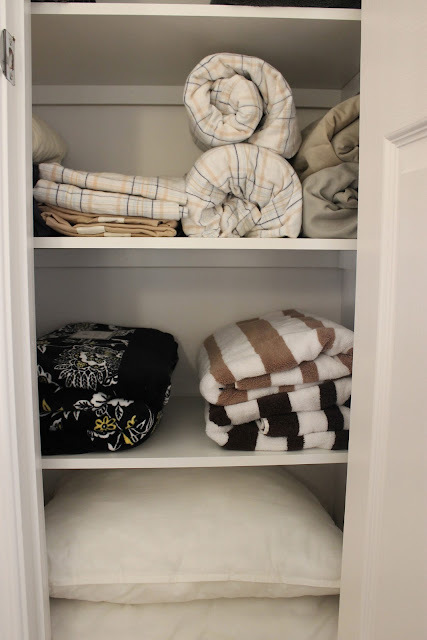 We had too many beach towels too, and keeping them all in the linen closet posed a bit of an organizational problem. So, I went through them and kept the few that we actually use. When it comes down to it, we don't need more than four beach towels for the two of us. 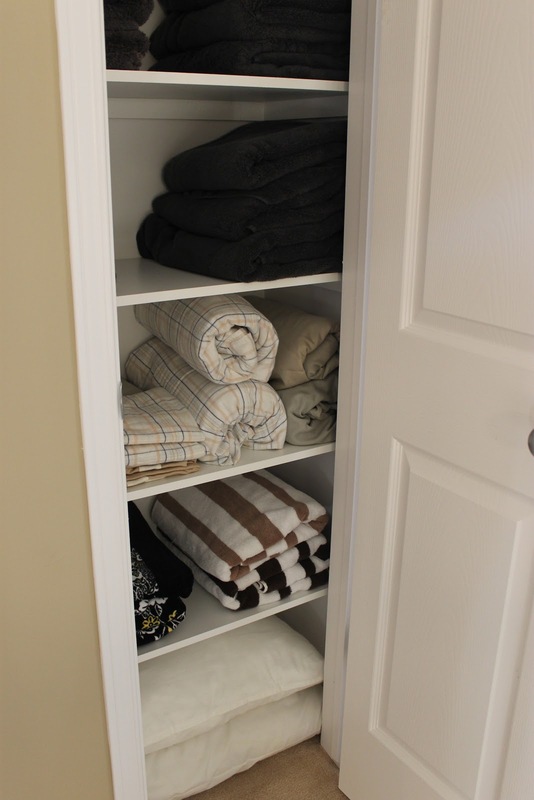 Do you have a large or small linen closet? 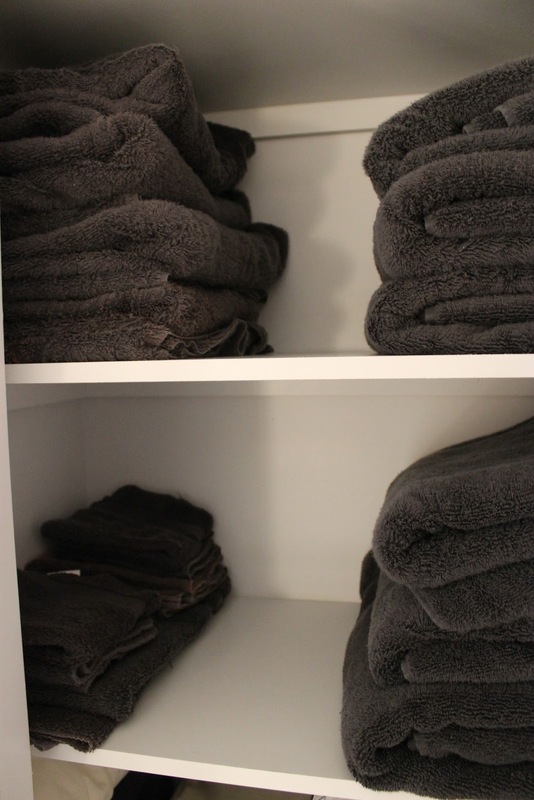 How do you store your sheets and towels? Do you roll your sheets, or are you a master at military-style folding? So, there you have it! 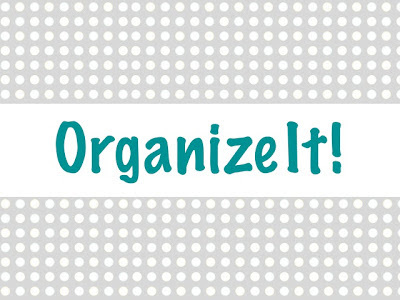 "Organize It" week has come to a close. I hope you enjoyed the week, and as usual I love to hear from you - whether comments, advice, or questions - so if you have any spots in your home that could use a little organizing, please let me know. I would be happy to answer any questions or feature a similar space in another "Organize It" week later on.